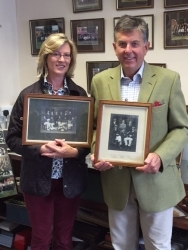 "During October 2015 the school was visited by Mr and Mrs. Richard Cook of Truro, Cornwall who kindly donated four framed photographs depicting Old Herefordians dating circa 1910. These wonderful old photographs depicted named old boys from various sporting school teams. Mr Cook came into possession of these items in the early 1970's following the death of Capt. Thomas Millyard who resided at Forde Grange, Decoy, a small village in Newton Abbot, Devon. Although Mr Cook unfortunately did not know Capt. Millyard, the photographs were passed to him from the housekeeper who was a friend of the family. Ever since, the photographs have remained in his possession and have adorned the walls of his various homes. It is known that Thomas Millyard and his twin brother George were born in Bromyard, Herefordshire in 1893. They both attended Hereford School where they excelled at all sports and later joined, like so many of their contemporaries, the Herefordshire Regiment at the outbreak of the First World War in 1914. An extract from the regimental history in 1915 records as follows, "One evening in the week, C company gave D company a 'good licking' at cricket but when the Battalion cricket team played Wickford they got 'badly beaten' and had been unlucky in losing some of their men before they had got into full swing. The last bats for the Herefords were Lts. G and T Millyard; T Millyard was run at 13, and G Millyard bowled out for a yorker for 2." Mr Cook also kindly donated to the school Capt. Millyard's British Army issue bible which he would have carried in the trenches. Research also indicates that Capt. Millyard was captured and held prisoner of war by the Germans in 1918. He died in south Devon in 1970."